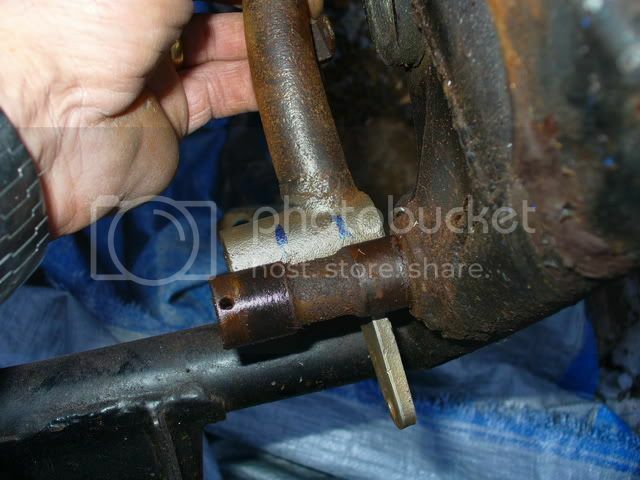 remove rear break sticking - NGWClub®, Inc. This was done on a stripped frame for clarity. Tools needed. Drill, drillbit 13/64, TAP 1/4-28, oil, rapidtap fluid, 1/4 grease fitting (zert) and sandpaper. First you have to remove rear break pedal from bike. You have to remove a small cotterkey and a large washer to remove pedal(no pic sorry) You can remove pedal from master cylinder(cotterpin & and small pin) or you can leave it as is and pull cylinder and all. Its up to you. When you get it off you will notice shaft has a groove. this is area where you will want grease fitting. put a mark on peddle where groove is. I have found that putting grease fitting on the bottom of the peddle makes it easier to get at. 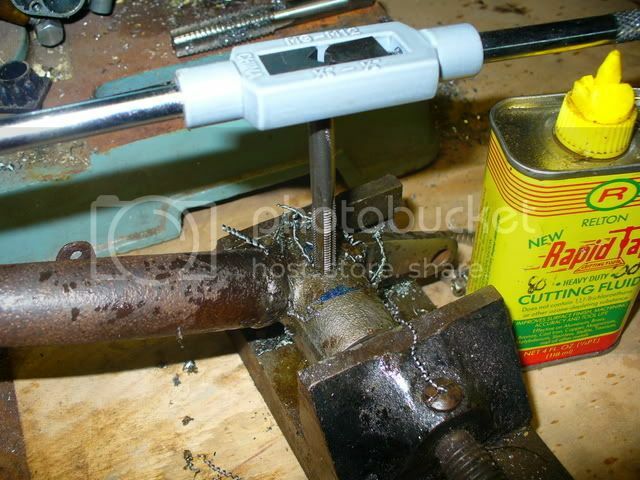 Now set up your 13/64 drill bit in your drill and drill hole in pedal tube make sure to use oil so bit stays lubed. Next take your 1/4-28 tap and tap out. Now you have threads to screw in fitting. Take emerypaper or sand paper clean out hole and make smooth. Do the same to shaft. 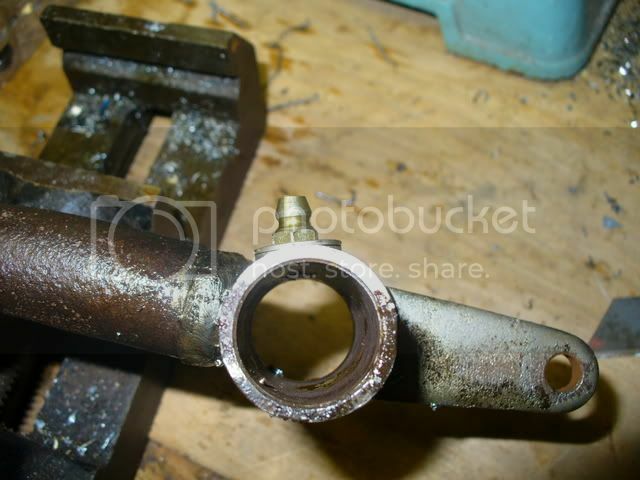 Take grease fitting and washer and screw in. The reason I used 2 washers was because fitting sticks in to far so pedal will not go back on without it. Or you can put pedal on then use just the fitting. Now put back on bike and put break unit back together. Now sock some grease to it and you should have no more problem with sticky pedal. You will notice I drilled hole on top of this pedal had to go get a 90degree fitting. Good luck I am having great success with the new spring. Running low on craped out pumps to rebuild. Awesome! Way faster than pulling it off, packing it and re-attaching it. Damn......... there's that Rapid Tap again !!!! Great. This is linked on ShopTalk now. Look at where your large shaft spring seats. Mark your hole location outside of that area, while still allowing grease to penetrate the shaft cutout area. I learned this lesson, the hard way. I had to fill my first hole with marine epoxy & drill in a new location. There are two types of motorcyclists, those who fell and others who are yet to fall. Apologize for my Google english! I'm having trouble getting rear brake pedal off the pin. It was set up when I bought the bike. I've slowly been working it back and forth - with a hammer, sprayed WD-40. Today I even heated it w/ propane torch and got out the pickle fork. It is still there! Am I missing something? 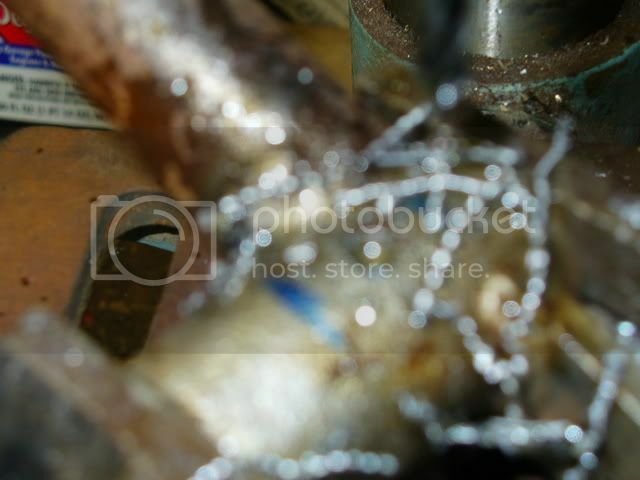 Whiskerfish has it right, only the cotter key, a washer and a pile of rust keep the pedal in place. 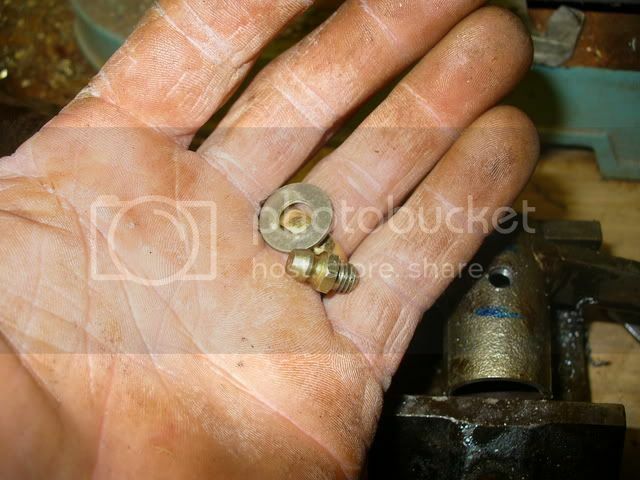 If you wish to make this modification by Peteybug, watch out where you drill the hole, leave space for the spring! Thanks for the replies. I had already removed washer, cotter pin, and spring. I guess it is just "set up". My next step might be a torch!! I'm getting the frame powder coated Sat. Soak it with penetrate and work it. Eventually it should slide off. It gave in to the up & down wrench - hammer!! The pictures by Peteybug show an error message right? 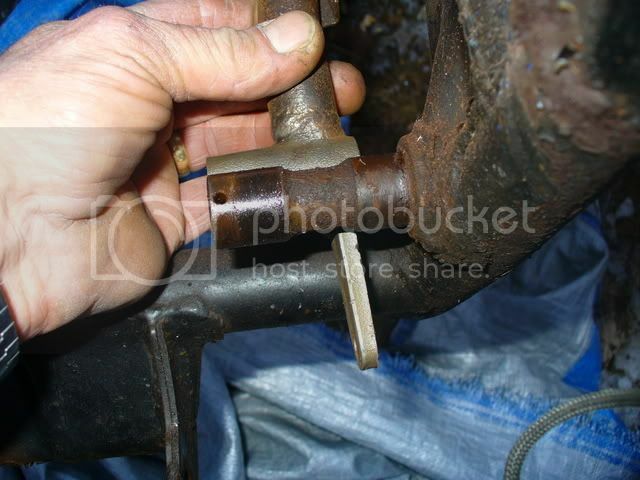 My rear brake pedal is stuck and I found this thread but without pictures it is not much help. Hopefully he can post the pictures again. Thanks in advance.